Properly designed and constructed asphalt pavements rarely wear out from traffic use. Weathering sunlight, water and ice, and the destructive effects of chemicals, gasoline and oil primarily causes surface deterioration. 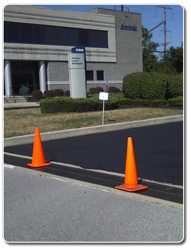 With a sealcoating maintenance program by Moore Seal, you will substantially prolong the life of your parking area. New pavement should be sealed as soon as possible after it is cured. Asphalt pavements that are not sealed are constantly exposed to destructive elements that cause expensive damage and shorten the service life of pavement. Sealing guards your pavement investment by providing a tough protective shield that locks out destructive elements and seals in the tars of the asphalt, keeping it resilient and durable. Through scientific study of the molecular structure of coal tar emulsions, the development of additives to enhance the molecular structure, and new engineering ideas regarding the deployment of sealcoating materials to different areas of your parking lot, we can offer sealcoating applications which are capable of outlasting conventional applications. Research has demonstrated that properly applied (and properly timed) sealcoat can save the owner of a property $100,000 or more — over the life of a hot mix asphalt pavement.